My little red flaxes would glow with sunset colours when in sunshine. The garden in this archive photograph is Jeremy's memorial garden border by the front of the house. 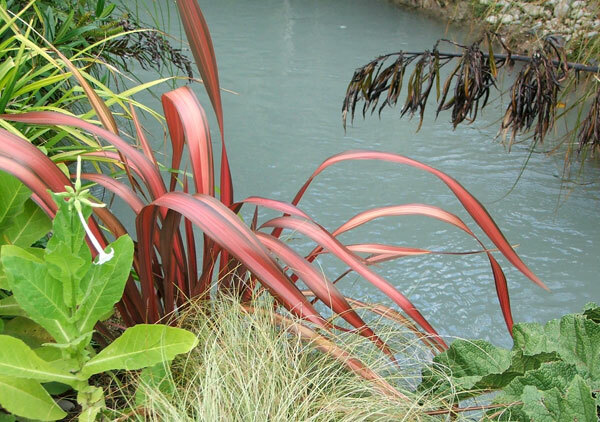 You can clearly see its resident little red flax. After three or four years things started to go terribly wrong. Many of my so-called 'little red flaxes' started seriously misbehaving. And as for their name - two things were very wrong. Firstly, the word 'red'. The word 'little' was also quite interesting. I couldn't believe that the original flaxes ware ever 'little', or that I'd expected them to remain so. How presumptuous! They quickly became person-sized, far too bulky for their positions. Obviously, like a puppy who grows into a large lumbering dog, they lost all their original cuteness. They became garden nuisances. 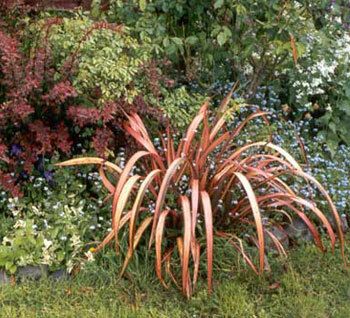 It's actually common for Phormium hybrids to lose their colour as they grow new leaves. Many just can't resist the temptation to revert to their original colour and form. But this story does have a happy ending. The nurseries always seem to have replacements, which are red, and little, to carry on the tradition!